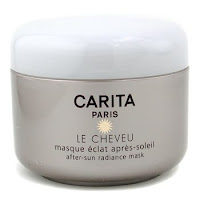 I recommend using Le Cheveu After-Sun Radiance Mask from Carita every time you go to a tropical country or to the beach. It’s also good to use even if you go to a covered pool. This moisturizing mask protects your hair against damages caused by UV rays, chlorine or salt and repairs damaged caused by these factors.